The new Thai ambassador to the United States, who happened to be in Chicago on Saturday, March 2, honored NIU’s Center for Southeast Asian Studies (CSEAS), by being among the center’s distinguished guests at its 50th anniversary gala dinner in Altgeld Hall that evening. His Excellency Chaiyong Satjipanon and an entourage – Songphol Sukchan, the Consul General of Thailand in Chicago, among them – joined representatives of the Indonesia Consulate in Chicago and Education Malaysia, Illinois State Rep. Robert Prichard, top NIU officials and center faculty, students and staff in marking the center’s half-century at NIU. After dinner was served to the 120 guests in Altgeld Auditorium, Provost Raymond Alden officially welcomed the dignitaries and guests on behalf of NIU President John Peters and the NIU Board of Trustees. Pritchard, who represents the 70th District including DeKalb in the Illinois General Assembly, presented CSEAS Director Judy Ledgerwood with an official proclamation commending the center for 50 years of research, language training, community outreach and the promotion of peace and understanding in Southeast Asia. The ambassador of Thailand to the United States, His Excellency Chaiyong Satjipanon, second from left, was among the dignitaries attending the Center for Southeast Asian Studies gala dinner. From left, the consul general of Thailand in Chicago, the Honorable Songphol Sukchan; the ambassador; Center for Southeast Asian Studies Director Judy Ledgerwood; Anne Kaplan, vice president of Outreach, Engagement and Information Technologies; and Provost Raymond Alden. In videotaped remarks, College of Liberal Arts & Sciences Dean Christopher McCord, on assignment for NIU in Myanmar/Burma, noted the foresight of the center’s founders and the work of faculty over the years in building an interdisciplinary program that continues to attract scholars and students to NIU. McCord cited the work of anthropology professor Susan Russell in the southern Philippines and the track record of Thai alumni whose work with NIU’s Thai Studies faculty has led to noteworthy careers in higher education and government in Thailand. He also mentioned two alumni, John Brandon and Tammy Duckworth, whose time in Southeast Asian Studies at NIU was formative in their careers. Brandon, who served as master of ceremonies for the evening, is now director of international relations for The Asia Foundation; Duckworth was recently elected to Congress, the first Asian-American woman elected to Congress in Illinois and the first member of Congress born in Thailand. 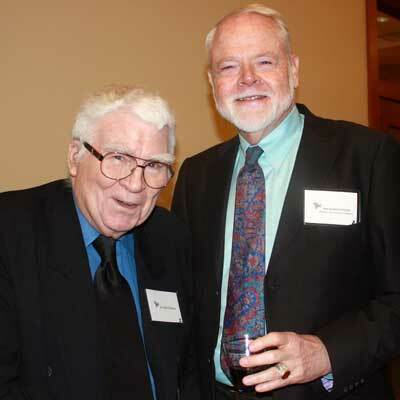 Political science professor emeritus Ladd Thomas, left, one of the founders of the Center for Southeast Asian Studies in 1963, with art historian and professor emeritus Richard Cooler, founder of NIU’s Center for Burma Studies. At the same time the Nehers were making their way around Thailand, he said, “a group of visionaries” were establishing a center for Southeast Asian Studies at NIU. 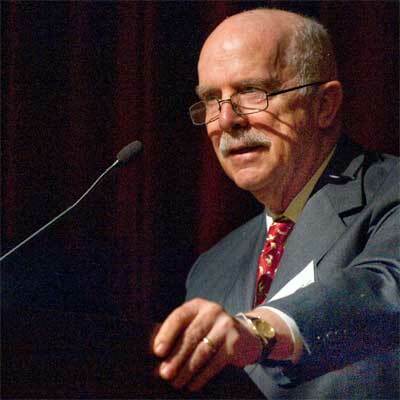 The center’s educational mission continues to be at the forefront, Neher said, citing the Donn V. Hart Southeast Asia Collection at Founders Library, outreach activities and innovative programs such as the interactive language and culture learning website (SEAsite) and youth leadership workshops. Bernadeta Pratiwi, consul of Education and Information for the Office of Consulate General, Indonesia, joins Deborah Pierce, associate provost for the Division of International Programs at NIU. “Center associates have given countless presentations in universities throughout the world. The center has overseen flourishing organizations such as the Council on Thai Studies and the Southeast Asian Summer Studies Institute (SEASSI). 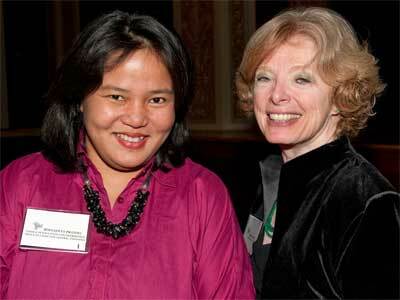 We have numerous formal relationships with universities throughout Southeast Asia,” Neher said. Following the remarks, the center presented framed certificates to professor emeriti Thomas, Richard Cooler and Neher, and to Arlene Neher, Jim Henry, Patricia Henry, John Hartmann and to center office manager Nancy Schuneman. The gala evening concluded with “A Celebration of Southeast Asian Performing Arts” at nearby Boutell Memorial Concert Hall. More than 300 people saw performances by the NIU Music Percussion Studio, the NIU Gamelan Ensemble, the Thai Cultural and Fine Arts Institute of Chicago, two NIU singers performing selections from the Filipino opera “Noli Me Tangere,” and three pieces by Malaysian world pop singer-songwriter Amirah Ali. The gala evening capped a weekend of special 50th anniversary events, which began Friday, March 1, with a keynote lecture by London School of Economics political scientist John Sidel, followed by a reception for faculty, students and alumni at the Barsema Alumni and Visitors Center. Before the dinner Saturday, Cooler conducted visitors through the center’s “Rarely Seen Southeast Asia: Art, Artifact, Ephemera” exhibit at the NIU Anthropology Museum (through May 15). 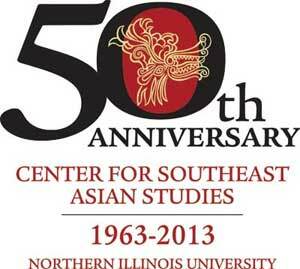 Wrapping up the year of the center’s 50th Anniversary events is a new exhibit, “50 Years of CSEAS and the Donn V. Hart Southeast Asia Collection,” at Founders Memorial Library, which will be on display through March 31. The Southeast Asia Club continues its Anniversary Film Series with “The Lady” at 6 p.m. Wednesday, March 6, in Cole Hall Auditorium.